The system will be an “Islamic Google Earth,” according to Mohammad Hassan Nami, Iran’s minister for information and communications technology. It will go by the moniker “Basir,” which means “spectator” in Farsi, and it reportedly will be ready for launch in the next four months. Google Earth merely feigns providing a service, Nami said, but is actually used by security and intelligence organizations to obtain information from foreign countries. What exactly will be different about the “Islamic” 3D map, Nami didn’t say. What better way to make it perfectly clear how differently you see the world? Let me start by apologizing for my irregular posting as of late. This weekend I was at a conference in Albuquerque and had zero time for blogging; and as the semester (my final semester of college!) comes to a close, I’m finding myself with less and less time for blogging. Be that as it may, I’m going to commit myself to making time to blog. I really love blogging (and communicating with you readers), so I can’t think of a worthy excuse for not engaging more consistently. 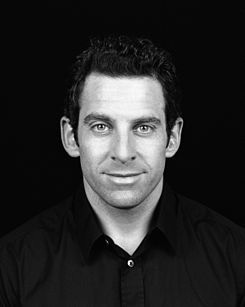 Today I mostly just want to direct you to read Sam Harris’ most recent blog post, which addresses the complaints of his critics. The post is outlandishly long, but necessarily so. Harris has been criticized for his views (or the views people attribute to him) on Islam, torture, war, airport profiling, and Buddhism – and he addresses each of these concerns comprehensively. I have already formed my own opinion about his rebuttal, but I’m interested to hear how others have responded as well. Harris is undoubtedly an exceptional and entertaining writer, and I enjoy reading what he has to say whether or not I agree with it. He is a controversial figure in atheist discourse – this new post will do nothing to change that. Please read what he has to say entirely, then leave your comments here if you so choose. I’m eager to hear the verdict. Home Minister Muhiuddin Khan said the three arrested men were among 84 “atheist bloggers” named in a list handed over by an Islamist group to a government panel probing alleged blasphemy against Islam on the Internet. “The arrests were made on primary information” and further investigation is underway, Khan said, adding the government would act toughly to prevent any attempt to upset “communal harmony” via the Internet. There has been vociferous debate between staunch atheists and fundamentalists in Bangladesh’s blogosphere and on social media for years, but it took a deadly turn in February when an atheist blogger was murdered. Can we please stop pretending that Islam is a peaceful religion? I know – there are plenty of Muslims who aren’t calling for the death of these bloggers. But there are also tons of “moderate” Muslims who aren’t speaking out against those who wish to execute humans for speech; and it’s not as though this is a new phenomenon among Muslims. Freedom of thought and conscience, and of speech, is guaranteed. 2. freedom of the press, are guaranteed. Freedom of speech and expression (real freedom – not the type that can be revoked under the absurd banner of avoiding offense) is essential to a prosperous society. That’s why I’m glad I live in the United States, where I can say that I think Muhammad was a clown and a wretched human being, and that Islam is a pathetic and destructive philosophy. Stop taking offense to blasphemy and start objecting to calls for violence against people who have done nothing wrong.